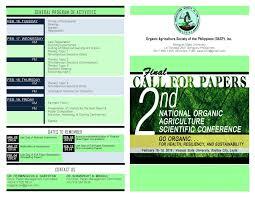 THE 2nd National Organic Agriculture Scientific Conference will be held on Feb. 16-20, 2016 at the Visayas State University in Baybay City, Leyte. The event is under the auspices of the Organic Agriculture Society of the Philippines (OASP) headed by Arsenio “Toto” Barcelona of Harbest Agribusiness Corporation, a distributor of various agricultural products that include seeds, drip irrigation systems, farm machinery, organic pest control products, plastic products and more. The association membership consists of scientists from state colleges and universities, students, researchers, organic farmers, inputs suppliers, traders and other stakeholders. A total of 200 to 300 participants are expected to attend the conference at VSU. Speakers will tackle various aspects of organic agriculture.The first Organic Agriculture Scientific Journal will be launched published by OASP together with Benguet State University. The Young Organic Farmers Club will also be launched with Undersecretary Berna Romulo-Puyat as guest of honor. In charge of the OASP Secretariat is Dr. Francisco Gabunada who could be contacted at 0905-913-2929. VSU President Jose L. Bacusmo can also be contacted at 0917-310-8076.